When you move to another country, there can be one of two ways of doing so. It is that you are moving with a company (employment relocation) or that you are doing it yourself, on your own, or with your family (such as retirement). In the case of employment relocation, more often than not, your traveling and moving, expenses are covered by the company and your lodging is acquired by them as well. So it is not a concern for you. But when making the move on your own, to buy or to rent deserves your full attention. ~ Forums geared to specific countries, or ‘expat’ forums where all countries are discussed. There are many out there but not all are good. When entering a forum, look for the stats, which will tell you the number of members, visitors etc. Next find out if the forum is active (lots of posters and daily interactions) by reading through the threads menu and specific threads. ~ Blogs (like this one) from people living abroad, or who have lived abroad, and share their experiences. If you have questions, don’t hesitate to use the ‘comment’ field. Bloggers love corresponding with their readers! ~ Tourist/vacation related websites have lots of info about the country in general. ► Real estate market. What kind of prices am I looking at. ► Purchasing procedures, requirements and time frame. What are the extra fees beyond and above the property price itself. ► Do I use a realtor, a real estate broker, an attorney… It is very important to find someone you can trust with your transaction and money. Ask for references. ► Political and economical state of the country. Semi to long term investment value. ► Will I have clear title of my property? ► Am I allowed to remain in the country for as long as I own? What are the immigration laws and different programs for expats? Once you are familiar with those points, it is then time for your second visit to meet with the contacts you have made during your research and view the properties that have peeked your interest. You can then safely make your purchase and feel confident about it. 10 ~ Living in Paradise! But, Where Is It? This blog can be written in only 6 words; Go see Harry in Spanish Lookout! Ok, maybe I can elaborate a bit more on this internet access! 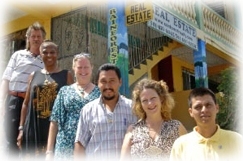 There are not too many installers in Belize, or in any other undeveloped 3rd world countries! So your first step is to locate them and find out what brand, system, equipment and provider they carry. They might only carry one, so your choice will probably have been made for you! Our choices were between different sizes of Hughes satellite dish and modems. As technology improves so rapidly we went for the latest model which was the HN7000S modem with a .94m dish. The installation of the dish is most important. It is attach to the roof so it has to be done professionally. Once installed, it must be precisely aligned and secured to the proper satellite. We had Harry and his brother do it all. Both of them on the roof, one at the dish and the other one sitting down with his laptop. In no time they had homed in to the satellite and secured the dish. That was in November 2006 and we’ve never had any major problems since. When the rain is really intense you may lose connections, but it is for a short amount of time and very rare. Through our provider, Hughes.net in the USA, we subscribe to the middle package which gives us a speed of : Download – 800 Kbps to 1 Mbps / Upload – 200 Kbps to 256 Kbps. This speed is sufficient for our usage requirements. At most and at the same time, we had 4 computers working on the internet with one connected to Skype making phone calls to the USA and getting a clear connection. The connection through Skype is not always clear, but Skype to Skype calls are usually far better. Skype to land line or cell phone sometimes has delays and tends to break up or off. But overall, it is acceptable enough when chatting with friends and family. To conduct business it is not the best. But for the fact of being in the middle of the jungle and being able to phone home is quite amazing and fun! And prices for both connection and call rates through a VOIP provider is much cheaper than the local phone company, and more often than not, more reliable. 9 ~ Living in Paradise! But, Where Is It? Building Off-Grid In The Jungle, Fun But Challenging! First thing first… you have to be there. Attempting to build while out of the country is a BAD idea, unless you have a really good trustworthy manager on site. Building contractors don’t always provide proper outsourcing for specifics like plumbing, electrical, painters/coaters, inside finishing such as kitchen and bathroom cabinets. Many do, but you have to be on top of everything, as anyone can call themselves plumber or electrician because no license is required in those fields. But did you know that to be a tour guide you must be licensed!!! There are good chances that you will end up having to find those labors yourself in the end. We went for wood buildings on cement posts. I recommend cement over wood posts (sturdier and longer lasting). The hardwoods of Belize are amazing. I never thought I would need to pre-drill a hole to pound a nail… plus I have never gone through so many drill bits in my life! The entire 1,500 sq. ft. floor is thong & groove Cabbage Bark. The walls and ceiling are a mix of Santa Maria, Red Wood, Mahogany, Ceba, and many others. The homework for this one is a bit tougher as communication can be an issue. Many contractors have ‘mini’ websites with some information. Email works well with many of them, but you have to be ready to get on the phone or better yet, go down for a visit! You also have to build in the right season. During rainy season, construction often comes to a halt due to some serious downpours that can last a month. So obviously the dry season is the time to do it. That season is from November to May. There a 2 ways to do the hot water; solar or butane. We have an on-demand butane water heater (very standard in Europe) and it works great. Those little heaters ignite when you turn on the tap by the pressure tripping the flint. All you need is a D battery for the igniter. Do your homework on butane. For your own safety, you might want to do your butane line yourself. Once you know how to flange an end correctly, it is relatively simple. Butane is important as it will also fuel your stove, fridge, and a clothes dryer if you chose to have one. What we have found out is that those butane appliances are easy to install and they are reliable… the fridge can be a little finicky until you figure out how it reacts to the weather and temperature changes.